Pictures and story sent along by occasional reader John. 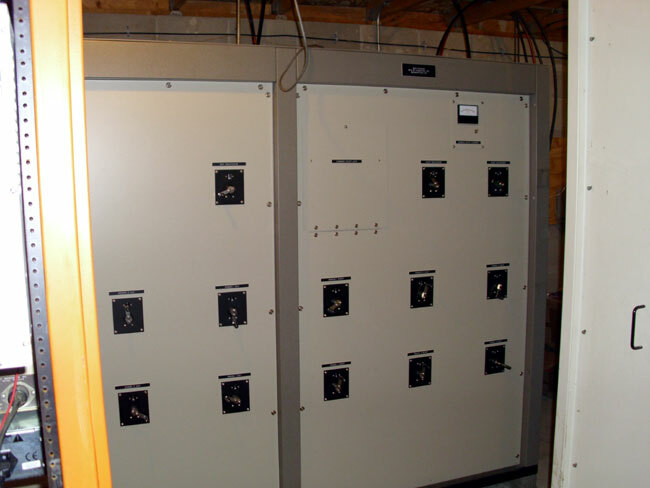 I worked on diplexing an AM station in 2003, it was a 5 KW and a 10 KW on a single tower. Those power levels require using some pretty large components, however, the set up was pretty straight forward. Each station had it’s own ATU (antenna tuning unit) which was then fed into band pass filters to isolate the other station and coupled to the tower. The ATUs were set up as low pass and high pass filters respective to their frequency. The whole thing had something like 45 dB isolation, which worked(s) very well. Doing this with a directional antenna system is another problem altogether. Add to that the tight filter networks required as the station are only 100 KHz apart. One saving grace, the power levels are relatively low. The higher the power gets, the more the magnetic fields build up around the coils and mutual coupling becomes an issue. 1560 (WGLB) owns the site and has been there for about 8 years. 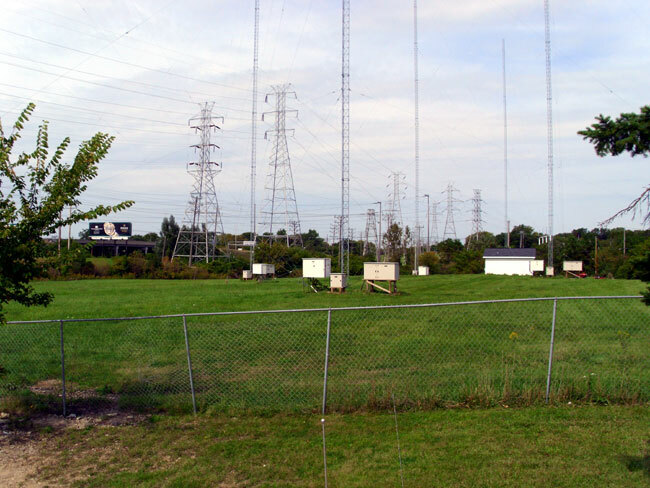 Originally WGLB was in Port Washington, WI with a BTA-250M running into a 2-tower array. The city of license was changed to Elm Grove, and this necessitated a move about 30 miles south to the site shown. 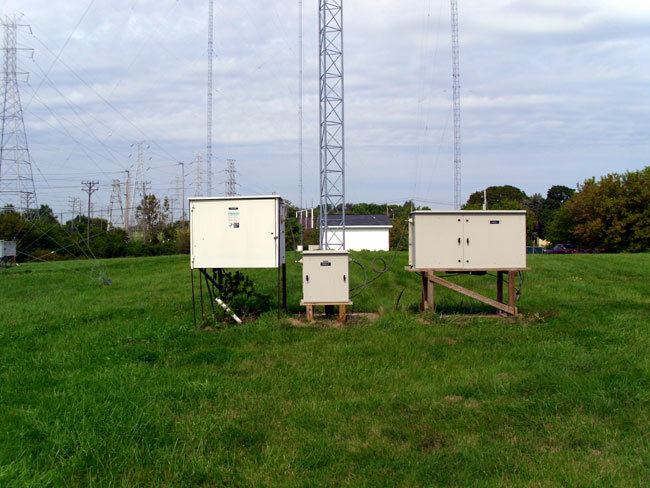 A 6 tower combination array was needed to protect 1550 in Lake Geneva, WI, 1550 in Madison, WI, 1550 in Morris, IL, 1540 in Hartford, WI, 1570 in Appleton, WI, 1530 in Cambpellsport, WI and 1530 in Elmhurst, IL. A 4-tower in-line array is used on 1560 during daytime, and a 4-tower parallelogram with the two south towers switched in and the North two in-line towers switched out (floated) for 1560 nighttime operation. Looks interesting. Fortunately the towers are not required to be painted or lighted, that is a big maintenance headache. Another thing to note; the site looks well maintained, the grass is mowed, no trees growing up by the transmitter building, the building is painted, etc. Likely these stations are locally owned and making a modest profit, not some abandoned after thought. An arrangement was designed when 1460 approached 1560 about leasing tower space for moving 1460 (ND-D) from Racine, WI north to West Allis, WI. This design is ingenious in that the array tower usage between the two stations is reversed for day-night operation! In other words, the 4-tower in-line array is used for 1460 nighttime, and the 4-tower parallelogram array consisting of the four south towers is used for 1460 daytime operation. The 1460 pattern is pretty tight to protect 1470 at West Bend, WI approximately 30 miles north, and nighttime also to protect 1460 in DesMoines, IA. 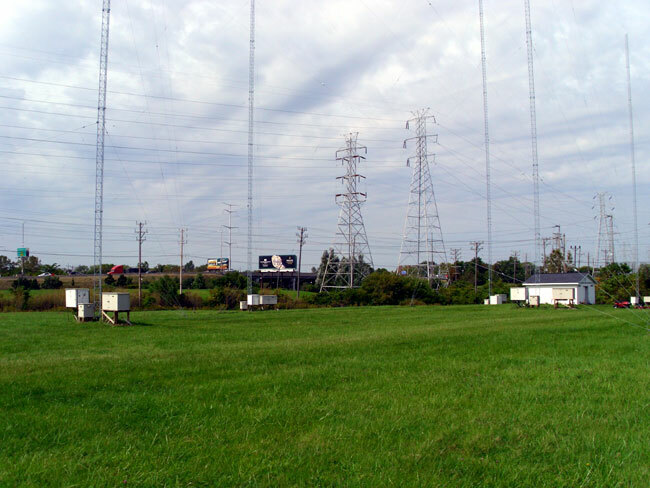 The friendly folks at Phasetek (Quakertown, PA) did the 1460 phasor and notch traps at each tower to prevent cross-modulation (inter-modulation) of the two signals feeding the towers, and after assembly on-site tuned up like a dream! And that is saying something. I have dealt with phasor manufactures before, sometimes they nail it, sometimes they don’t. Tune up can be a real challenge, which tends to put everyone on edge. I might add that the high-tension electrical transmission towers nearby were de-tuned at 1560 years ago, and upon checking were broad enough to not require any further de-tuning at 1460! Another attribute of this design is that if something ever changes in the future, the deal can be easily be dissolved, because there is no mutual ownership of any equipment on site! It is truly one of the best “Win-Win” instances of AM station directional antenna combining I have ever seen! It is good to see stations taking advantage of co-location these days. It is a great way to save money on real estate and hassles with the zoning boards, who all see dollar signs when someone talks of putting up a tower. With the amount of computing power and the lessons learned in the past 90 years or so, we are beginning to get this medium wave broadcasting thing down.